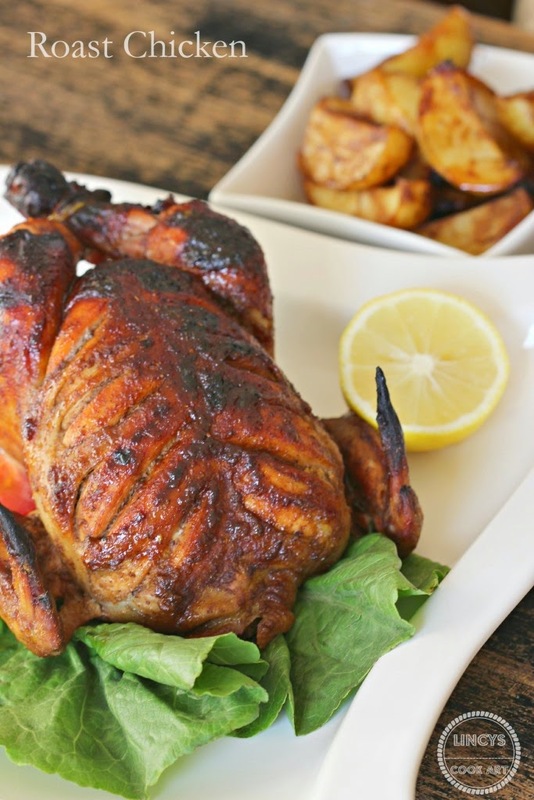 I love this roast chicken and this is one of my family favorite roast chicken. I donot know one such recipe exists. I used to make roast chicken simply with Chinese sauces. I wanted to give that recipe a variation for a competition and I just made this roast chicken in a chinese way by adding the Chinese 5 spice powder (i refereed Sanjeev Kapoor's Chinese dishes book for this spice mix) and then i just added sauces of my sauce and made this recipe. But the result was really amazing. The sweetness of the honey and the spices and sauces really an amazing chicken every one must try. I feel this recipe would be perfect for parties and gatherings like Christmas, Thanks Giving..etc. You can taste the perfect balance of flavour and taste. In a pan add peppercorns, star anise, fennel seeds, cloves and cinnamom and dry roast for a minute and allow to cool and finely powder it on a blender; set aside. Wash the chicken and pat dry the chicken with a towel and allow to dry under a fan for 5 to 10 minutes. Then score the chicken with a knife. In a bowl add 5 spice powder prepared from that 1 tablespoon, honey, ginger garlic paste, soya sauce, tomato sauce, chilli sauce, mustard powder/sauce, ginger garlic paste, chilli powder, pepper powder, salt, butter and lemon juice and mix well. Apply the marinade over the chicken and allow to soak for 1 hour. Transfer the marinated chicken in a oven proof tray. Keep some cut garlic, onion or veggies of your choice. Drizzle some oil preferably olive oil over it. Preheat the oven oven 200 degree for 10 minutes. Keep the chicken inside and bake for 1 hour or till the chicken pricked with a fork or knife juices run clear. I kept some cut garlic, onion and some half boiled potatoes cut and mixed in the leftover marinade and baked together with the chicken.You could bake veggies of your choice.